(Please note this is a free view of this week’s ‘own the ecg‘ blog. Enjoy). A 79 year old man presented to the emergency department with a 2 day history of nausea, vomiting, lethargy and left abdominal pain. He appeared pale, clammy and unwell. His initial observations revealed a pulse of 50/min, BP 170/87, sats of 98% room air and a respiratory rate of 30. He was afebrile. The obvious abnormality being a sinus bradycardia with a rate <50 and frequent ventricular ectopics. His PR, QRS and QT look normal (in the sinus beats) and he has no T wave abnormalities. Given his pallor, diaphoresis and pain he underwent urgent further assessment with team approach. His medical history included diabetes, Paget’s disease, Parkinson’s disease. 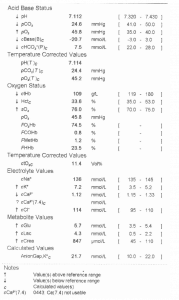 His previous notes revealed chronic renal impairment with creatinine of 146mcMol/l and eGFR 39 mL/min/1.73m2. He used metformin and Lantus to control his diabetes and was usually well controlled. He is in severe renal failure with life threatening hyperkalaemia. He has a severe metabolic acidosis. (1.5 X 7.5) + 8 = 19.25+ 2 if compensation was complete- not far off! Yet his ECG has no T wave peaking, a normal PR, QRS and QTc. Is the gas wrong? Is the ECG wrong? Is it possible that ECGs are not particularly useful in detecting and risk stratifying hyperkalaemia? Traditional teaching describes the sequential appearance of ECG abnormalities seen with rising potassium levels as follows: peaked T waves, PR interval prolongation, QRS prolongation, loss of P wave, escape rhythms, “sine wave” configuration, ventricular fibrillation, and pulseless activity or asystole. This is increasingly being demonstrated as incorrect. In a 2008 study by Freeman et al. of patients presenting to ED with hyperkalaemia (K+>6.0) initial electrocardiograms (ECGs) were abnormal in 83% of patient visits, including 24% of ECGs with nonspecific ST abnormalities. (1) The classic teaching findings were rarer: peaked T-wave morphology (34%), first-degree atrioventricular block (17%), and interventricular conduction delay (12%). The severity of hyperkalaemia did not correlate with the ECG findings. The most recent, and possibly best investigation into ECG correlation with serum potassium was published in July 2017 in the Western Journal of Emergency Medicine (3). 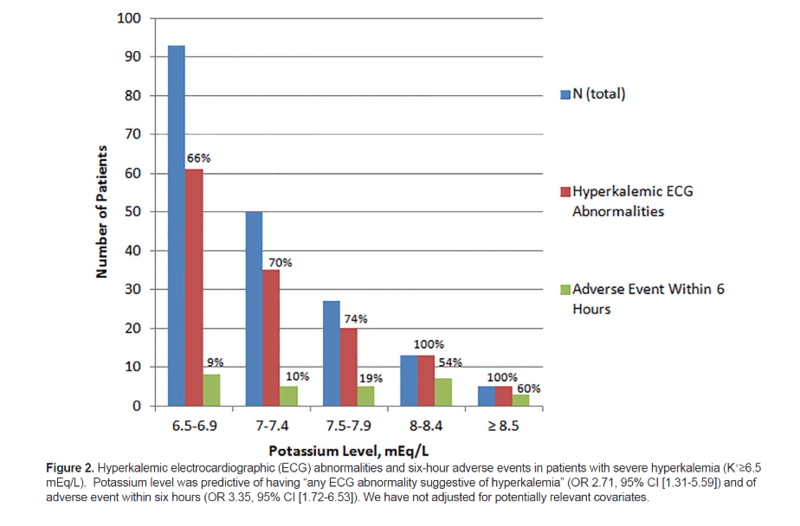 This was an observational retrospective cohort study of 188 cases of hyperkalaemia (K+>6.5) comparing ECG changes with occurrence of adverse events with 6hrs of ECG and potassium measurement (regardless of treatment). They defined an adverse event as symptomatic bradycardia, ventricular tachycardia, ventricular fibrillation, cardiopulmonary resuscitation (CPR) and/ or death. They divided ECG changes into (1) peaked T waves; (2) PR prolongation; (3) QRS prolongation; (4) bradycardia (HR<50 bpm); (5) 2nd or 3rd degree heart block; (6) junctional rhythm; (7) ventricular escape rhythm; or (8) ventricular tachycardia. They then tried to identify any statistically significant association between the ECG changes and adverse outcome. Of the 188 episodes a total of 134 (71%) had any ECG abnormality suggestive of hyperkalaemia, with the two most common findings being QRS prolongation (43%) and peaked T waves (30%). The mean time between ECG or serum potassium result and adverse event were 36 and 47 minutes respectively. Probably most importantly there was no statistically significant association between T wave abnormality and adverse outcomes. The strongest association was that between bradycardia and adverse outcome. That can partially be explained in that symptomatic bradycardia was one of the adverse outcomes used in the study so the leap from asymptomatic bradycardia and a asymptomatic one is probably not great and may explain that finding. Other than that QRS prolongation and ventricular dysthymias had the highest associations with adverse outcome, again not surprising. This study once again demonstrates that the ECG alone is of little value in the diagnosis and risk assessment of hyperkalaemia, but may be useful as part of the risk assessment if we concentrate on QRS abnormalities and rhythm disturbance and disregard T wave morphology. Freeman et al. Effects of presentation and electrocardiogram on time to treatment of hyperkalemia. Acad Emerg Med. 2008 Mar;15(3):239-49. Montague et al. Retrospective Review of the Frequency of ECG Changes in Hyperkalemia. Clin J Am Soc Nephrol. 2008 Mar; 3(2): 324–330. Durfey el al. Severe Hyperkalemia: Can the Electrocardiogram Risk Stratify for Short-term Adverse Events? WestJEM. 2017 July; 8(5): 963-971. 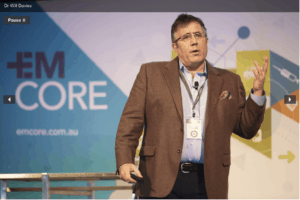 See Dr Davies at the EMCORE Conferences as he brings his expertise in this and other subjects to you. Tags:Hyperkalaemia ecghyperkalaemiapeaked T wavesPR interval prolongationQRS prolongationloss of P waveescape rhythms“sine wave” configurationventricular fibrillationand pulseless activity or asystole.